•Cancellations made 15 days or more before the arrival date will be 100% refundable. •Cancellations made 7 days before the arrival date will be refundable at 50%. •Cancellations made with 48 hours. or less before the arrival date is not refundable. •There is no refund for reservations that do not appear on the day of their Check-in ("No show"). It is the guest's obligation to keep their conversations in a moderate tone so as not to disturb the rest of the other guests. It is strictly forbidden to remove the towels from the rooms. The hotel is not responsible for forgotten items in public areas of the hotel, or for forgotten items inside the rooms after check-out. Smoking is not allowed inside the rooms. Any improper behavior will result in removal from the Hotel (additional will be charged for the expiration of the total cost of the reservation). The guest agrees to cover the cost of repairing or replacing any property, furniture or property material that has been totally or partially damaged, either carelessly or intentionally. The guest will refrain from using tape recorders, electrical appliances, musical instruments or noisy games that disturb the tranquility of other guests. Cost per lost key $ 100.00 MXN. No parties or high music are allowed in the facilities. Un lugar seguro y tranquilo, con un ambiente cordial, cálido y relajado, estilo fresco y la buena vibra que necesitas para olvidarte de las preocupaciones durante tu visita. Localizados a 5 minutos a pie de la playa y a dos cuadras del centro de Holbox, nos encontramos en una zona alejada del bullicio, entorno ideal para tu pleno descanso. Las habitaciones son amplias y acogedoras, equipadas con baño propio, agua caliente, ventilador de techo, frigobar y aire acondicionado; podrás elegir entre una estancia privada o compartir experiencias en nuestros dormitorios. Somos pet-friendly por lo que las mascotas son bienvenidas en reservas realizadas en habitaciones privadas. 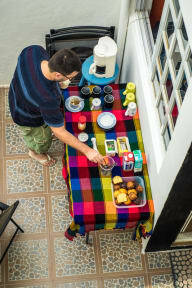 Degusta una deliciosa taza de café todos los días en nuestra cocina compartida, donde tienes todo lo necesario para preparar tus alimentos o en la terraza con wifi, donde es posible disfrutar de días soleados con brisa. 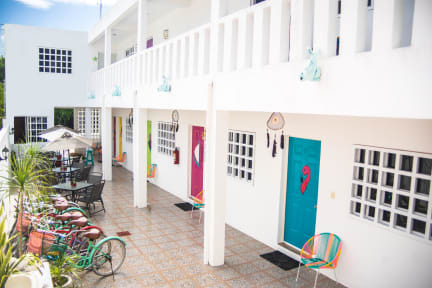 I had a wonderfull stay at Beach Inn Hostel! Staff was very helpfull. Beds were very comfortable. Good shower. Quiet hostel, loved it! The bed was extremely comfy and big! Not a hostel feel since there aren’t any bunk beds. Personnel was friendly and helpful. Rooms were air conditioned! Lovely place! Staff is great and very helpfull! Had a good stay here! Nice hostel and friendly & helpful staff. Beds were big and very comfortable (no bunk beds). Unfortunately no wifi signal in the rooms, shower wasn't great, and no breakfast included. Het was er schoon en netjes en het personeel was erg aardig. Ik vond alleen de sfeer in het hostel niet zo leuk.